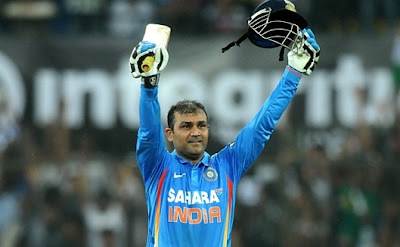 Our Dangerous Batsman Vireder Sehwag makes his record breaking double Centurey in ODI Cricket Machtes against West Indies in Indore at 8th December 2011. It is is maiden Double century in ODI. He became the second player score a Double century in ODI Cricket Matches. He also scored 2 triple centuries in Test Match Cricket and famous for his attacking batting was out of form recently, made a strong come back in that innings. Sehwag hit 142 rusn in boundaries (25 fours, 7sixes), the second highest in an innings after Shane Watson's 150 runs (15fours, 15sixes). viru scored 219 runs from 149 balls with the help of 26 fours and 6 sixes. He broke the record of Sachin Tendulkar, who scored 200* notout against South Africa at Gwalior in 2010. He is the only batsman in the world to have scored highest ODI & Test scores for his country. He made 319 runs in a Test against SA. He is the only batsman to score triple century (he has 2) in Test matches and a Double Century(219) in ODIs.